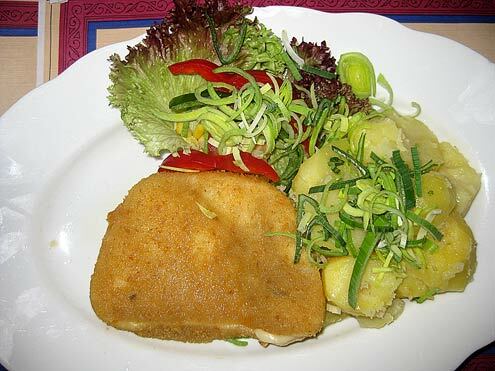 If our recent trip to Prague is anything to go by, it would appear the only vegetarian option available in the Czech Republic is deep fried Edam with boiled potatoes. Nothing wrong with that of course – cheese and spuds are two of my favourite food groups especially if the former is heavily grated over the latter and grilled to a molten bubbling layer of stringy cheesy goodness. Pan Heggerty is one such combination and makes a delicious and warming side-dish (or indulgent lazy supper/hangover brunch) perfect for these Arctic times. Makes: Side dish for 2 hungry people. Melt the butter in a frying pan and fry the onions until they are soft and golden. Now put the potato into the pan and sauté until they are beginning to soften and have a little colour. 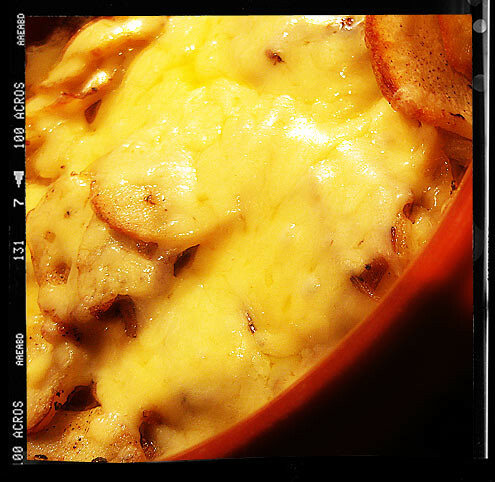 Find a suitable ovenproof dish and add the potato and onion in alternate layers, seasoning each layer as you go along. Pour over a little more melted butter and place in the oven for 20 minutes or until the potato is cooked. Sprinkle with a generous layer of grated cheese and grill until melted and bubbling. Verdict: Puts the yum into yumblog. Drink: A sip of wine for her, the rest of the bottle for him. Entertainment: ‘Après vous’ on DVD. Some would say a gentle poignant screwball romantic French black comedy. Others would say it’s over-long but has a superb central performance from Daniel Auteuil and is generally very watchable. They might even go on to say that it is twenty times better than any subsequent Hollywood kooky remake probably starring Hugh Grant, George Clooney and Sandra Bullock. Pan Heggerty – this is delicious. Don’t be stingy with the freshly ground black pepper and serve with ketchup.